Elena Paige loves telling stories which inspire and transform young readers. She writes from the heart, and especially loves weaving magic into many of her books. Some of her stories are based on real life events and some are cleverly crafted in her imagination. She never releases a book without running it past her two marketing consultants - her daughter, aged 10 who inspects all books for elements of magic, and her son 13, who insists every story must include humor. Of course they don't always get their way! As a child she was constantly reading Enid Blyton books and now insists that magic is REAL! Her fiction stories help children think and feel more positively about themselves and life. On Sunday mornings you can find her hiding under her doona cover reading, while her children are wondering where their favorite book has disappeared to. 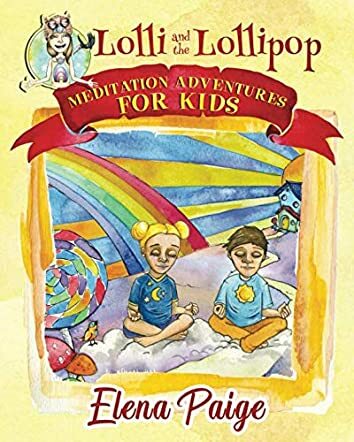 Come on a meditation adventure with Lolli in Lolli & The Lollipop: Meditation Adventures For Kids by Elena Paige. Are you feeling sad, misunderstood, or angry? Did you have a bad day? Lolli understands. She doesn't want you to feel bad, so she has invited you to visit her home. She is certain that she can help you feel better. Take Lolli's hand and travel to the amazing Land of Color. Don't worry, you won't get lost in the Land of Color, but you will see some spectacular sights and meet some interesting characters. In the Land of Color, you may even learn a few things. Do you need cheering up? Did you know that some birds may even wear polka-dotted undies? Well, they do in the Land of Silly! Lolli will gladly take you there if you want to go. She is sure that you will feel so much better when you get back home. You never know what you will do when you take an adventure with Lolli, only that you will come home smiling. Children have bad days too. Lolli & The Lollipop by Elena Paige is a cute meditation book for children. The reader is given step-by-step instructions on how to breathe, relax, and send love before going into each meditation. As the child is transported through various "meditation adventures," they are gently instructed to release old habits and beliefs that no longer serve them, and are reminded that they are fun and creative, and so much more. The meditations are written in such a way that the child will be able to cultivate these important habits and values without triggering ego and causing over-thinking. The adventures are fun and help to calm the child while guiding the use of their active imaginations. Since it is clear that the author knows how to meditate properly, I would highly recommend this book to parents that are serious about teaching their young children to meditate. I would suggest this book to parents and children ages 4-7. I found my horrible week just melted away after reading the first few paragraphs, so I am confident it could be helpful to an overly stressed parent of young children as it can be used as a nightly meditation or a calming book for storytime. Lolli and the Lollipop is a collection of guided meditations for children, written by Elena Paige and illustrated by Josef Hill. Parents and caregivers can read the meditations while their children or charges are in a relaxed position with closed eyes, or they can share the pictures with the children as they read along. Lolli is the children's guide for each meditation. Lolli wears the colors of the rainbow, and she comes from a land that is sunny all the time and filled with color. During the meditations, Lolli takes children to different places where they have adventures. In the first meditation, Lolli introduces them to her Land of Color, and they can relax with her on a hill that has giant colorful mushrooms, fruits, vegetables, and lollipops growing on it. The lollipops are special as they make anyone who stands under them feel calm and worry-free. Anything that's upsetting just seems to disappear under a giant lollipop. Lolli also gives children a special way to reach her any time they'd like to visit with her. Elena Paige's collection of guided meditations, Lolli and the Lollipop, is a brilliant way to teach children how to meditate and relax. While I can definitely see the benefits of having a child listen to the stories with their eyes closed and enter a meditative state, I would also strongly recommend that parents and caregivers also share the pictures with their children. Josef Hill's watercolors are marvelous! They truly bring Lolli's Land of Color to life and form the perfect base for a child's imagination to work from. As someone who's meditated for many years now, I can really appreciate how Paige makes these meditations work, especially the selection of crystals, building the child's own special place where they can be creative, and the use of the lollipop as the key for slowly leaving the meditative state. In fact, I liked these meditation adventures so much, I'll probably be trying modified ones for myself as well. Lolli and the Lollipop is most highly recommended. Lolli and the Lollipop by Elena Paige is an empowering book designed to make kids aware of their creativeness and imagination. It's highly colorful and illustrated to guide kids through the fun adventure. Lolli directs the children in a fun loving way to not only listen to the adventure, but to experience it as one who is traveling right alongside with her. This is a wonderful book for children which will grab and hook young readers from the start. Lolli and the Lollipop is an interactive book that welcomes children into an exciting journey of relaxation. It's designed to be read to a child at bedtime or any time when the child may need to unwind and explore the vastness of their imagination. I believe this book will sit well with children. Some may even try to follow, often mic-miming the adventures as described to them. Lolli takes children on a comprehensive adventure from land to land, with specific instructions for children to interact with. The author's creativity is interactive on all levels. I found myself smiling at the lovely pictures as I read along. It's one of those books that will easily put a smile on your child's face. I recommend this fun, engaging book for children ages 4-10. The illustrations are very colorful, engaging, and exciting. Lolli and the Lollipop should be listed among other notable books for children, and added to the curriculum for all Elementary schools. This book is a great way to help children unwind and relax with their imagination.